Credit: Courtesy of the Northwest Passage Project. On August 23rd, a team of scientists, students, and a professional film crew aboard the research vessel Academik Ioffe set out from Resolute Bay in Northern Canada. Their mission? To study the arctic environment as part of the Northwest Passage Project. The expedition was supposed to last three weeks, but just one day after the crew embarked the vessel became grounded and the expedition had to be suspended. Brice Loose, chief scientist aboard the Academik Ioffe, and microbiologist Mary Thaler, a passenger aboard the vessel, join Ira to share what happened and discuss the science that had to be put on hold. Brice Loose is Chief Scientist aboard the Akademik Ioffe, and an assistant professor at the University of Rhode Island in South Kingstown, Rhode Island. Mary Thaler is a post doctoral researcher at the Université Laval in Quebec City, Québec Canada. IRA FLATOW: This is Science Friday. I’m Ira Flatow. On August 23rd, a team of scientists, students, and a professional film crew set out aboard the research vessel Akademik Ioffe to study the Arctic environment. The expedition was supposed to be a three week tour, but just 15 hours after the vessel embarked it ran into trouble, quite literally, and the expedition had to be suspended. Here to tell us what happened and talk about the science that had to be put on hold is Brice Loose Chief Scientist aboard the Akademik Ioffe and Assistant Professor of Oceanography, University of Rhode Island. Welcome to Science Friday. BRICE LOOSE: Hi, Ira. Thanks for inviting us. IRA FLATOW: You’re welcome. Mary Thaler, postdoctoral researcher at the University of Laval and one of the vessel’s expedition members. Welcome to Science Friday. MARY THALER: Hi. It’s great to be here. IRA FLATOW: Let’s talk about this, Mary. So the expedition was underway for what, not even 24 hours before the vessel was ran aground? What does that mean? What did that feel like? MARY THALER: Well, we had gotten on board the previous evening. Some of the scientists had been working through the night to get their equipment set up because we were planning to have our first sampling, our first sampling station the following afternoon. And I had gotten up in the morning, it was after breakfast, rounded up a few of the students and they were helping me set up gear. And as we were working in the laboratory space, there was a sudden shock. It was about 11 o’clock in the morning. It was strong enough one of the girls was sitting on a crate and slipped off onto the floor. And when we opened the door of the lab and looked out, the deck was on a very slight slant. And what had happened was the ship had run up onto an underwater rock and had completely stopped moving. IRA FLATOW: And everybody was rescued, everybody was OK from the ship? MARY THALER: Yeah. Yeah, we had a ship nearby. Very fortunately, they were able to take us off and everyone was completely safe. IRA FLATOW: Bryce, this is sort of, I’m not going to say poetic justice, but it’s sort of an interesting coincidence because you were there to actually research the ground that would be safe to swim in, to sail in. BRICE LOOSE: Yeah, it’s true, Ira. You know, we were basically operating in what are largely unexplored waters, so this is the Nunavut Territory of Canada connects the High Arctic with the North Atlantic around Greenland. And it’s an area that’s traditionally, for much of the year, like really covered in heavy ice. And so much of the area that we’re transiting through is not well-charted, so we don’t really have detailed maps of the ocean bottom and I think this might be part of what led to the incident that occurred with us. We weren’t there to do mapping, or at least not mapping of the bottom, but we were there instead to focus on mapping of the ocean properties, both of the marine microbes, as well as the gases dissolved in the water– methane, and carbon dioxide, for example. And then carry out some seabird surveys in the area, which dovetail nicely with what the Canadian Wildlife Service has been doing for years now. IRA FLATOW: Does this have anything to do with the Northwest Passage and all the Arctic being so free of ice, increasingly free of ice and maybe a new climate happening over there? BRICE LOOSE: It certainly does. In fact, we actually had to be rerouted at the beginning of the expedition because a large part of multi-year ice, which is ice that’s lasted for several years, basically broke free this year and moved into the northern part of the Northwest Passage, so we were able to transit there and had to go someplace else, to an area that’s even less well-known. And, you know, this multi-year ice breaking up is yet another indicator of increased temperatures and the loss of ice during the summertime as a result of climate change. IRA FLATOW: Mary, had you been able to stay, what kinds of science were you planning to do in the Arctic? MARY THALER: Well, I’m an environmental microbiologist, so that means my particular interest is anything in the water column that’s single-celled. So when we think of the Arctic, the images that pop into people’s minds are often polar bears, large marine mammals, like seals, things like that. But in fact, the very basis of the food web, what is harvesting sunlight energy and turning that into food for the rest of the organisms, are these single-celled algae. And so we were going to be going out, collecting samples, and just looking at what kind of communities and species were living in that water and how they’ve been changing over the years. IRA FLATOW: Now, I know you’ve been on research vessels in the Arctic before, but what have you learned from your many times going back? MARY THALER: Well, this was, in fact, my eigthth voyage to the Arctic on a ship. We have been seeing changes in the previous decades. 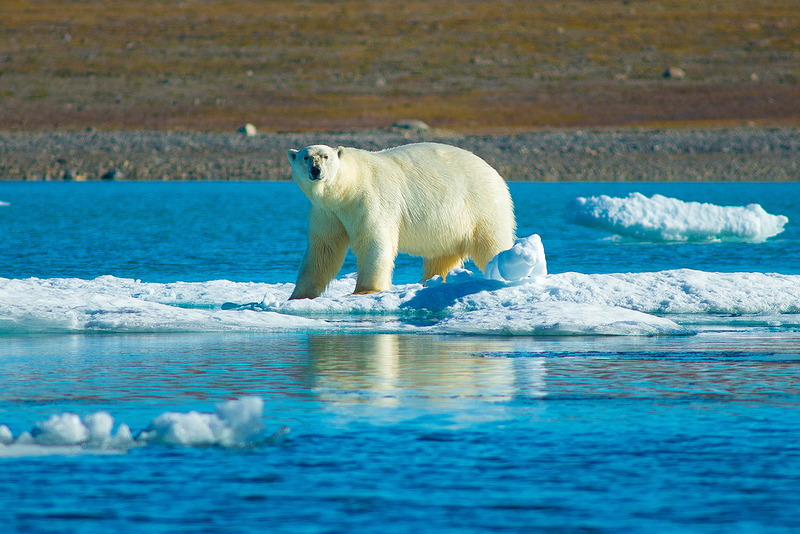 One of the biggest changes in the Arctic is that it’s getting fresher, in fact. So connected with a lot of ice melting and snow and ice melting on land causing more outflow from the rivers, we’re seeing increasing volumes of freshwater being added to the ocean. And that, of course, changes the amount of nutrients available. It changes the way that the water mixes and circulates and that has a strong effect on single-celled organisms living in it. IRA FLATOW: So with all that fresh water are you going to see a layering? Is the freshwater going to sort of sit above the seawater? MARY THALER: Yeah, that’s exactly what happens. Freshwater is less dense than saltwater, so it floats on top. And because it has the buoyancy, it resists being mixed by the wind. It’s almost like oil sitting on top of water. And this is very crucial because the nutrients that support food webs are deeper in the water column. So that wind mixing is what brings it up to the surface and make it available. IRA FLATOW: Wow, that’s really interesting. That’s something that hasn’t been seen before up there. IRA FLATOW: Bryce, will these same expedition members get to come back and complete their mission at some point in time? BRICE LOOSE: So that’s not 100% certain, but that’s definitely our goal. We’ve got a great relationship with the operator of the vessel and we’re already basically back at our institutions regrouping for next year. We had a really great team of like 16 undergraduates from universities across the lower 48 of the United States as well as from the Nunavut Territories of Canada. And we really hope to basically, essentially get the whole group, get the expedition back together and try this again. IRA FLATOW: How disappointed everybody must be. BRICE LOOSE: Yeah, there were definitely some tears and some long faces on the way back when it was clear that things weren’t going to proceed. But I think everybody is hopeful that we are going to get a chance to do this again. And that’s kind of the way it is with science, you know, this isn’t the first time that an expedition has had to stop or make a change. And you just kind of continually, when you’re operating in an area like this, you just got to be prepared to regroup and go at it again. IRA FLATOW: We’ll have to send you up a better sonar, I think. BRICE LOOSE: We would love one. Yeah, thank you. IRA FLATOW: I don’t know why you don’t have that. So for you, Mary, this is old hat. You’ve been up there eight times. You understand these sorts of things happen, right? MARY THALER: It is not the first time I’ve had science delayed or rerouted or even canceled. What matters is perseverance. We got up there– it’s a challenging environment. You have to hang on to your sense of humor and your calm and know that sometimes things will work and it will be amazing, and sometimes you’ll run into a few roadblocks, literally. IRA FLATOW: We should name your next vessel The Perseverance or something. MARY THALER: Yes, I think so. IRA FLATOW: All those Antarctic explorers all had those vessels named something like that. Well, thank you very much for both of you for taking time to be with us today and good luck next year. BRICE LOOSE: Thank you, Ira. IRA FLATOW: Very best. I hope the expedition resumes next year. Brice Loose is Chief Scientist aboard the Akademik Ioffe and the Assistant Professor of Oceanography at the University of Rhode Island. Mary Thaler, Post-Doctorate Researched at the University of Laval. Century-old Antarctic photos offer a peek into Shackleton's ill-fated Ross Sea Party Expedition. Physicist Lisa Randall explores the theory that a disc of dark matter could have been responsible for the catastrophic collision that extinguished the dinosaurs.